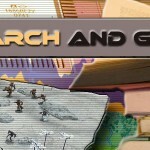 This series of articles examines several 19th Century war games designed primarily for the use of professional armies. The first article reviewed von Reisswitz’ Prussian Kriegsspiel of 1824, considered by many to be the first modern wargame. This article looks at William Roscoe Livermore’s American Kriegsspiel: A Game for Practicing the Art of War Upon a Topographical Map, copyrighted in 1879 and published in 1882 and in 1898. Captain Livermore’s game is based upon the Prussian original, modified over the years to reflect technical and tactical changes, but he had limited success selling it to the War Department. 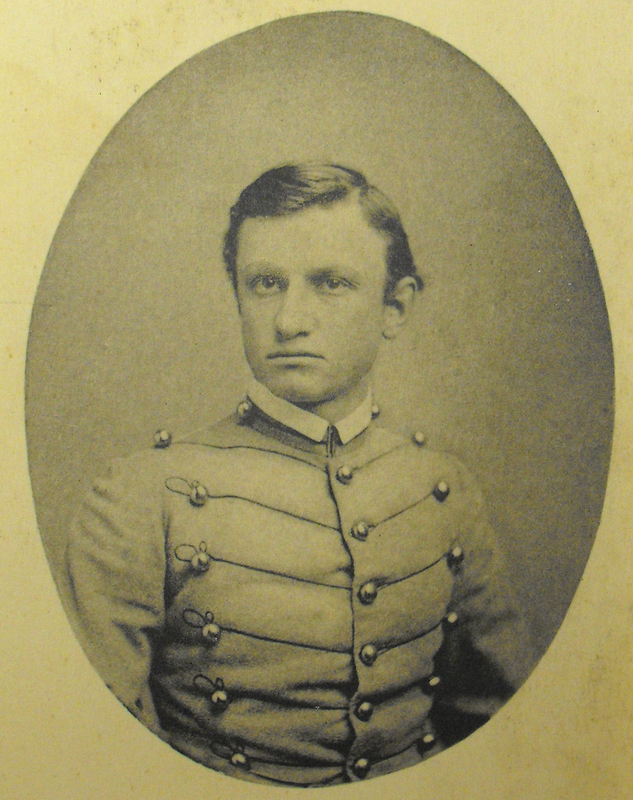 An 1865 graduate of West Point (sixth in his class), Captain Livermore was introduced to the Prussian wargame that year by fellow engineer William Popp, a former Bavarian Army officer. Livermore conducted topographical surveys in the Great Lakes and Texas, surveyed and supervised work on fortifications on both coasts, was Army Attaché in Denmark (observing Prussian military exercises), and served as a senior engineering officer with the VII Corps of Major General Fitzhugh Lee during the Spanish-American War. That Corps trained in Jacksonville, Florida and its low levels of illness compared to the rest of that army might reflect Livermore’s care in setting up its camps. VII Corps finally went to Havana in January 1891 as an occupation unit. Livermore is also associated with several inventions including a magazine fed rifle (rejected by the U.S. Army which chose the Krag-Jorgensen rifle instead). Captain Livermore’s stated purpose was to bring war gaming in the American military to a new level with a manual game that dispensed with detailed paper record keeping while offering instant resolution of even tactical level engagements as detailed as those in the classic war-game. Crediting Count von Moltke the Elder for Kriegsspiel’s survival and popularity, Livermore believed that German success in 1866 against Austria and in 1870 against France had increased contemporary interest in the game outside of Germany. He noted that interest in the United States had really begun in 1867 and increased in succeeding years (although not without resistance as Livermore would find Phil Sheridan among those not terribly interested when he tried to sell American Kriegsspiel to the US Army). Livermore identified Lieutenant Naumann’s Regiments Kriegsspiel, published in 1877, as the closest German game to his own and acknowledged his debt to the improved Kriegsspiel introduced by the German officers Trotha and Tchischwitz. However, Livermore emphasized that his newly published version presented superior labor-saving processes and much improved game mechanics reflecting 13 years of playing experience. He also noted the influences of du Verdy’s pamphlet Beitrag, zum kriegsspiel which Livermore said set forth “the method of conducting a game; and the work of Captain Baring, Royal Artillery, who translated Kriegsspiel into English in the 1870s (used at West Point). 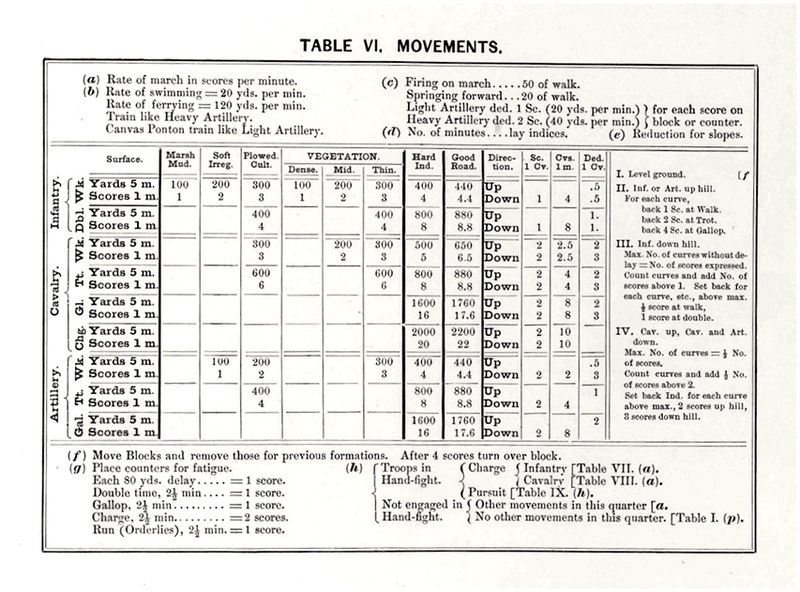 This article examines the published tactical version of 1882. All editions consist of one volume of rules and a second volume atlas containing the tables and illustrative plates. The playing pieces and apparatus could be reportedly ordered separately from Houghton Mifflin (1882) and later W. B Clarke (1898), with pasteboard boxes for the playing pieces, dice, pincers to move pieces with, etc. American Kriegsspiel is preferably played with two maps (1/20000 to 1/2000 or from 3 inches to 30 inches to a mile) with forces ranging from a handful or as many as 100,000. The map contours should show elevation changes at 10 foot intervals. The maps (about three feet by five feet) could be laid side by side on one table and separated by a partition or screen, or ideally they would be on tables in separate rooms divided by folding doors so that the Umpire (and assistants) can view both maps at the same time. 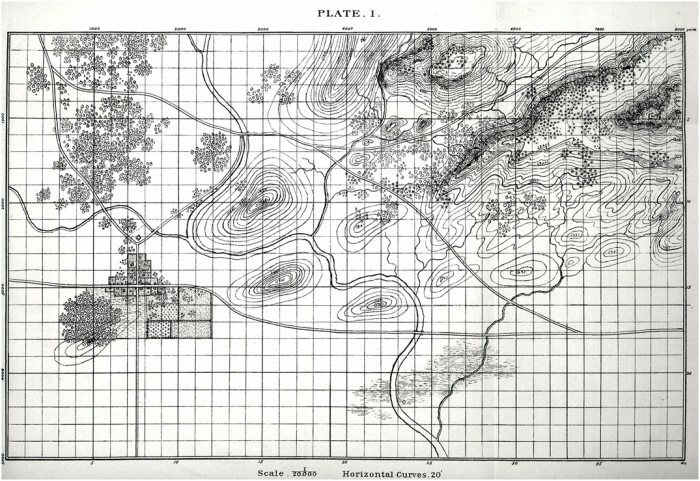 The game used ¼ scale copies of the game map (with 20 foot interval contour lines) for reference by players and as a means of recording movement, fire, charges, and combat over the play of the game. Livermore also specifically states that when a game has reached a point when a number of the units on both sides are visible to each other, the game can shift to using a single map (perhaps anticipating that the game is nearing its climax or decision point) while any remaining hidden movement can be managed by having the other players step away or by using generic markers on the same map. The game can be played with as few as three individuals including an Umpire, although Livermore insisted that his rules “are specific enough” for players to do without an umpire. As the number of participants increases they can be sorted into an Umpire and assistants, a Blue Commander in Chief (CinC) and subordinates, and a Red CinC and subordinates. Once play begins the CinCs and their subordinates are not allowed to converse (except by messenger) or even approach the map together. The Umpire presents each CinC with the written “General Idea,” if possible a couple of days before play. The General Idea includes “information well known to both sides… the general object of the campaign, the results of previous engagements, etc.” Each CinC also receives a unique “Special Idea” containing information known only to his side, preferably in the form of orders from a superior that set forth what his force is to accomplish. Each commander is given the exact number of his own forces and his objective, as well as the probable size of the force opposing him. Livermore specifically states that this latter information can be entirely erroneous and that each CinC might be given missions that do not direct them to engage each other but which set the stage for an encounter incidental to their respective missions. The Umpire will also indicate the line or points beyond which each side will not be allowed to deploy in his initial troop placement. Red must dislodge the Blue rear guard from its position in some hills within a set time period, if possible cutting that rear guard off from its main body or forcing it back upon that main body such as to delay its retreat. Red and Blue represent the right and left flanks of their armies. A convoy or the capture of a train or a village. A reconnaissance in force or a foraging expedition. American Kriegsspiel used similar pieces to represent the two armies, colored red and green for one side and blue and orange for the other. These included blocks representing infantry companies in line or column; half or full companies deployed as skirmishers; officers; troops of cavalry; horses; 4 gun artillery batteries; 2 gun half-batteries of 3-inch guns, howitzers, Hotchkiss 1 ½ inch revolving cannon, or Mitrailleurs; artillery caissons; ambulances; canvas or wooden pontoon trains; wagons; mules; ammunition loads; and even field fortifications, among other things. There were exchange pieces to show a unit that had detached skirmishers and small pieces to represent the skirmishers. The blocks with the darkest red or blue tint were artillery – a gold stripe distinguishing the guns from the light blue or red stripe of the caissons. 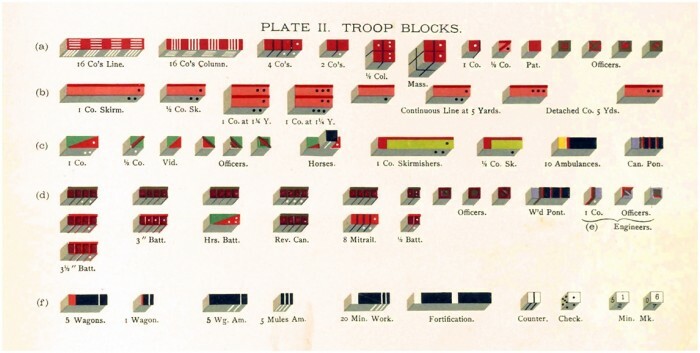 Cavalry blocks had two color markings, green and red or orange and blue. Engineer units were represented by purple blocks with a red or blue colored stripe. Long black pieces represented ammunition wagons carrying 20,000 rounds and short black ones represented five mules carrying 2,000 rounds each. An eight-wagon ambulance train was represented by a black piece with yellow ends. Black markers represented telegraph units, baggage, supply trains, and individual wagons. The playing pieces also featured markings on several sides indicating strength, formation, and direction of facing – “the deeper shade denoting troops in line of battle and the light tint those deployed as skirmishers.” When the units are first placed on the map, the blank side of the block was up and the end on which the hidden sides are scored would be to the right as it faced the enemy. One side of an infantry block displayed horizontal lines indicating 16 companies in line of battle and another side featured vertical lines representing 16 companies in column. the 3-inch gun had 120 minutes of fire or 240 rounds. the progressive destruction of buildings under artillery fire. Combinations of markers could convey additional information. A horse artillery battery would be represented by replacing the caisson piece with a cavalry block or by marking the caisson block’s surface with a stripe of complementary color. 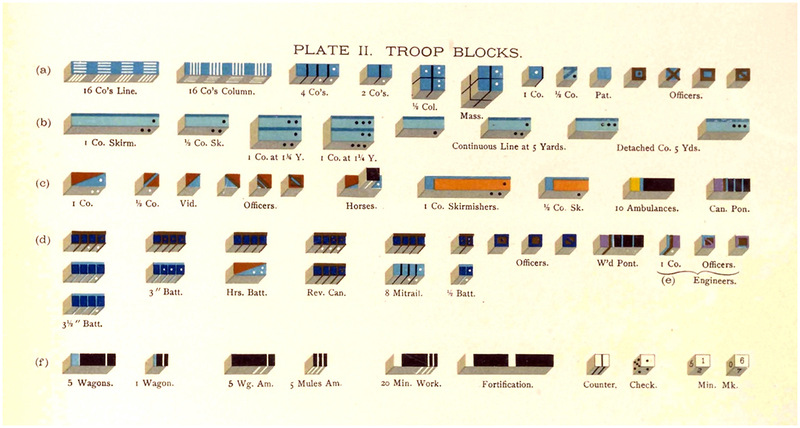 The horses of dismounted cavalry would be represented by the cavalry block with an ammunition block placed upon it, the dismounted cavalrymen shown by infantry blocks. Long black and purple blocks represented one division of a pontoon bridge train in single file and one of the same blocks would represent the finished bridge resting in place. Livermore included two kinds of metallic pointers or indices, in his apparatus, by means of which the Umpire and players might take in the battlefield situation at a glance. He acknowledged that Meckel in Prussia and Zipser in Austria used similar devices but claimed that American Kriegsspiel presented a more extended application. A sword showed intended movement while an arrow indicated direction for firing. Each marker bore a series of lines or scores across their short dimension, dividing it into five or ten segments. The scores could be used to indicate intended or elapsed time for a specific movement, firing weapons, or other action. For movement each score represented 20 yards. Placing the short sword on a unit to expose 2 ½ score lines in front of the playing pieces indicated that unit would advance 200 yards over two and one half minutes. Two short swords could be combined to indicate an intended ten minute march. Two long swords would indicate the intention to “double time” the noted distance. Swords could be placed to indicate the amount of preparation time required for a unit to swim across a river. A short arrow would indicate normal “common fire” of six rounds per minute for five minutes. Two short arrows, one in front of the other, would indicate ‘rapid fire,’ 12 rounds per minute. A single short arrow positioned with four of its five scores visible in front of an infantry block could indicate four minutes of slow fire at three rounds per minute, or two minutes of rapid fire. A short arrow in front of an artillery unit indicated canister fire, a long arrow case shot, and a long and short arrow together indicated five minutes of shell fire. A short sword in front of an infantry block with an arrow placed at the sharp end of the sword and pointing towards an enemy unit would show that the infantry unit intended to walk 200 yards and then fire for five minutes at the indicated target. An sword and an arrow side by side would indicate that the unit would advance by rushes, stopping to lie down and fire and then rising up to advance again, until it had covered the indicated distance. 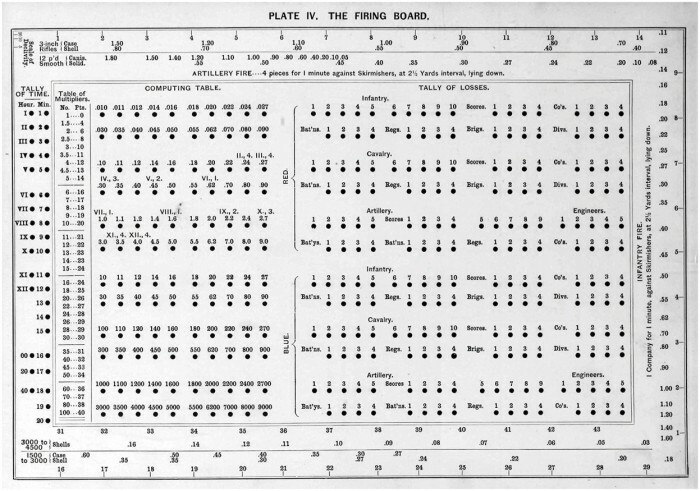 Captain Livermore designed one special apparatus for his game – The Firing Board (Plate IV). 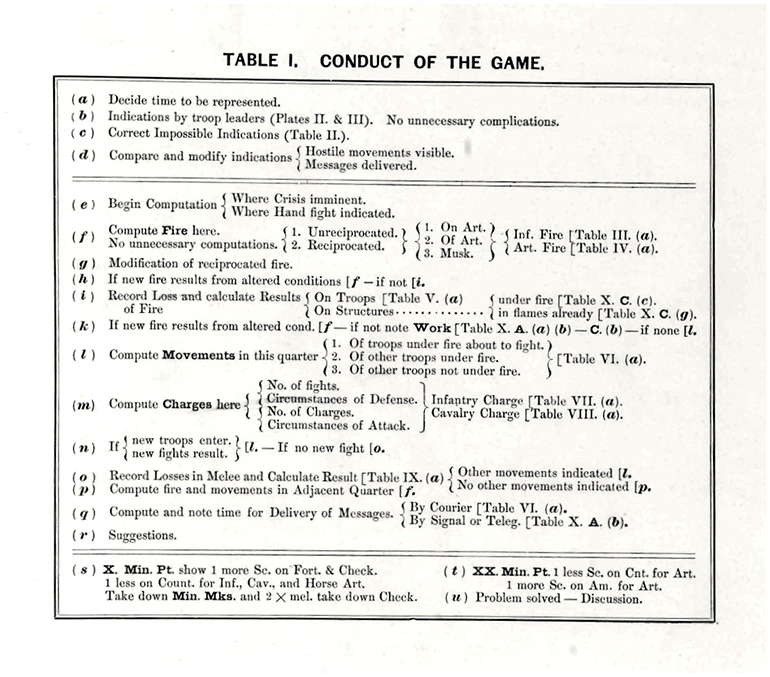 The Umpire used the Firing Board, in conjunction with the tables and dice to calculate and record losses from combat and track the passage of game time. The Firing Board had several features. The Tally of Time – a white peg in the hole marked VII and another in the hole marked 20 and a third in the hole marked 11, would show the time to be 7:31; or in the strategic game, it would show the evening of July 31st. Scale of Infantry Fire (right edge) showing the rate of loss per minute to the fire of one company of infantry at each indicated range, marked off in intervals of 100 yards. Scale of Artillery Fire does the same for artillery, out to 1,500 yards along the top edge and out to 4,500 yards along the bottom edge, for either 3 inch guns or 12 pound smoothbores firing solid shot, shell, case, or canister. Tally of Losses – colored pegs record cumulative killed and wounded by battalion, etc. for each army. Table X. Engineer Operations, Etc. Umpire decides upon standard one minute turn or longer as appropriate. Livermore authorizes the Umpire to adjust the standard turn to permit longer movements outside combat or to complete a specific action, especially when the two sides have yet to come into view of each other. Players set out new arrows and swords (Tables II, A, B, C) to show intended actions. When appropriate, the Umpire at this point declares the problem completed and opens discussion. After confirming players’ orders as valid, the Umpire identifies where a “crisis” is imminent and where a hand-to-hand combat is indicated. Table II. 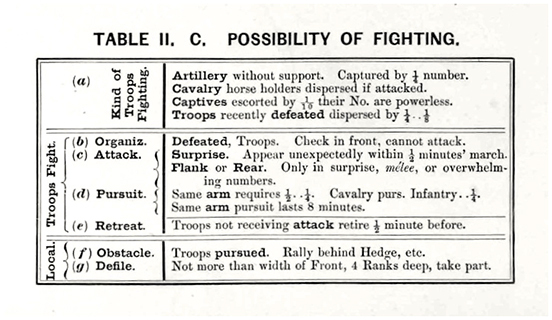 C. Possibility of Fighting reflects the guidance given the Umpire in determining whether a collision or combat will take place, based upon the circumstances of specific units and the orders of their commanders. As noted, any fire or close combat in which either the attacker or the defender has a 4:1 or stronger advantage results in an automatic victory for the greater side, with only the issue of losses to be resolved through the normal process. Among the factors considered here are formation, ammunition supplies, terrain, and the lingering effects of any previous combat or movement. Troops will almost always reply to hostile heavy fire. Infantry marching in line cannot fire. Skirmishers marching cannot execute rapid fire. Cavalry can dismount and prepare to fire in half a minute or more. Artillery unlimbers and comes into action in one minute. Artillery first coming into action against a distant target often require additional time to determine proper elevation, range, etc. He first resolves attacks in which the firing unit does not face return fire, starting with fire attacks on artillery, then fire attacks by the artillery, and then attacks by infantry fire. The Umpire repeats this sequence for attacks in which fire is returned by the defending unit. will inflict upon that second company a casualty rate of 0.45 men per minute. He then examined variations to his standard case to finish the tables. For example, infantry in a single rank close order formation would only be 80% as effective as this while in two ranks, their fire would be only 70% as effective. Having determined that the firing unit can engage the target, the Umpire calculates the number of hits. This can be done mathematically or on the Computing Table. Table III. 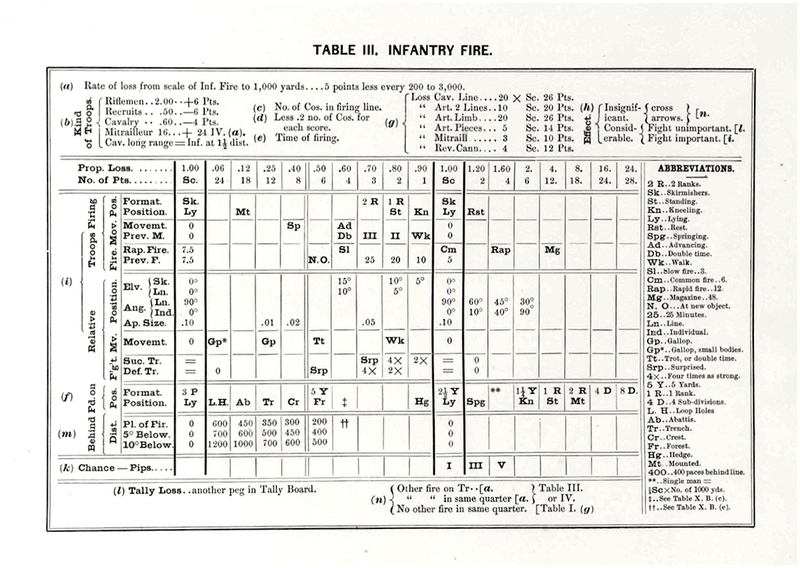 Infantry Fire lists modifiers horizontally and tabs and reviews them in alphabetical order. The numbers atop each vertical column show each modifier expressed both as a number which can be found on the adjacent Multiplier Table and converted into points for use on the Computing Table. The factors in fire combat considered by the Umpire include: 1. 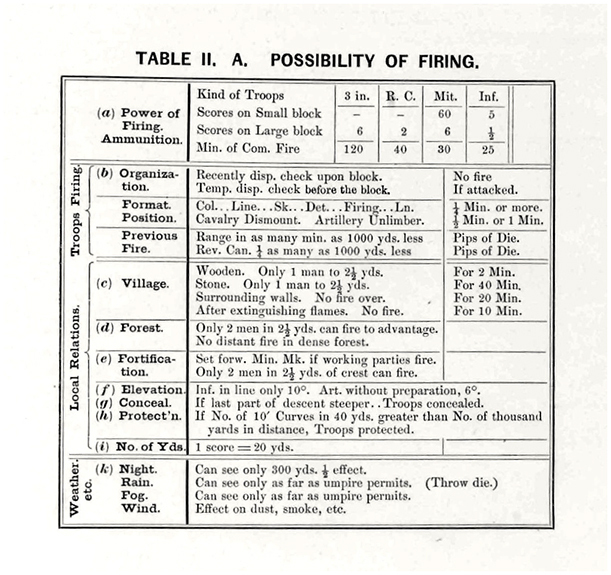 The base fixed rate of loss from infantry fire is derived from the range from the firing unit to the target unit using the Infantry Fire scale. The standard case has an infantry company (64 men) firing in a skirmish line and a base rate of inflicted loss of 0.45 at 500 yards. This rate of loss shown on the scale reduced by five points for everyadditional 200 yards out to 3,000 yards range. If that infantry company was in single rank close order, its fire would be only 80 percent as effective; if in two ranks, 70 percent. Dismounted cavalry, armed with single-shot breech loading carbines, would be less effective and rated at 0.6 or –4 Points. Rapid Fire at 12 rounds in a minute has a value of 1.60 or +4 points. 5. The base rate of loss is reduced when firing on non-infantry units such as artillery, especially if the target unit is at less than full strength. 6. Are the projected losses from weapons fire insignificant or considerable in the judgment of the Umpire? Is the fight important or unimportant? The Umpire may conclude that it is not necessary to fully calculate losses at this time. 7. What formations are the firing unit and the target unit using? Are they moving? Infantry standing in a close, two-rank formation would have a value of 0.70 or 3 points and a value of 0.80 or 2 points for standing. If the target unit is on horseback, the Umpire uses 12 percent of the 0.45 base rate of loss; if kneeling infantry, 90 percent. If the firing unit is behind a log, an embankment, or a window sill, or a shelter from hostile fire that also provides a rest for their weapons, their fire is valued at 120 percent of the standard. Infantry moving in rushes, springing forward a short distance and then lying down to fire, would be valued at 40 percent of the base rate (and would have time to fire about twenty rounds in five minutes). If firing as skirmishers in advance or retreat, 60 percent (and they would not be able to fire more than three rounds per minute). [It is interesting to note that Livermore wrote that “It is always assumed that infantry at a halt will lie down whenever exposed to fire, unless otherwise expressly stated.”] 8. The positions of the firing and target units relative to each other, i.e., directly facing each other or one facing the others flank, and whether they are on different terrain levels, and whether or not the target unit is moving. If the target unit is moving at the trot while receiving fire, a factor of 0.70 or 3 points is added to the computation. If there is no hostile fire on the firing unit, then another 1.20 and 2 points is added. Livermore stated that losses were often two or three times the number of killed and wounded. A company of 64 men (infantry or cavalry) was reduced in effectiveness in close combat or weapons fire by 20% for the loss of 5 men; 40% for the loss of 10 men; and a loss of 20 men represented a reduction of 80% in effectiveness. A unit would be considered to have no combat value after taking 33% losses. a) Find the rate of loss by placing the bottom corner of the Scale of Infantry Fire rule (on the edge of the Computation Table) on the firing unit and then lower the scale on to the center of the target unit. Read off the distance and the accompanying number for the base fixed rate of loss. This number is then used to begin the series of calculations and in this example is: 0.45 which we know a roll of the large die can modify as high as 0.80. The mathematical result of 192 modifies the original base result of .45 (above) to give us 86 casualties. The Computation Table result is 90. The final number is the total casualties, killed and wounded, suffered by the target with no distinction made between the types of casualties. 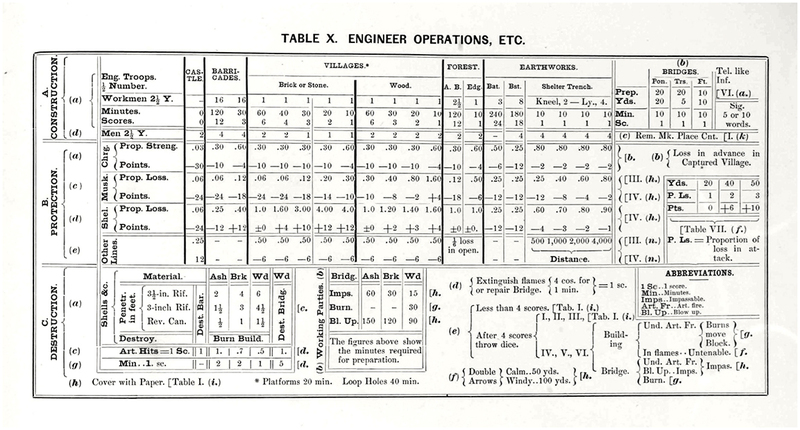 160 men have been killed or wounded according to the Computing Table, which for the purpose of the game is acceptably near enough to the 154 result from the mathematical calculation. l) Tally Loss: This loss is recorded upon the Tally of Loss which is divided into two identical sections on the Firing Board labeled Red and Blue. 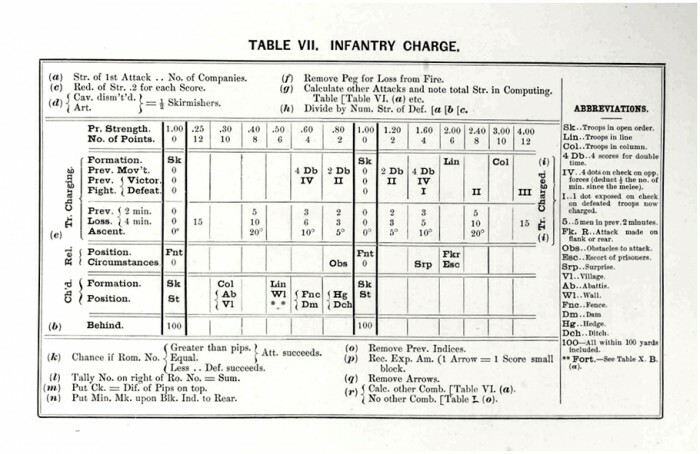 Separate tracks for Infantry, Artillery, and Cavalry start with holes for individual losses, then a set of holes marked Scores which track casualties by fives, and then sets of holes for companies, battalions, regiments, brigades, and divisions as the losses mount and whole formations are eliminated. Artillery fire combat is resolved in similar manner. 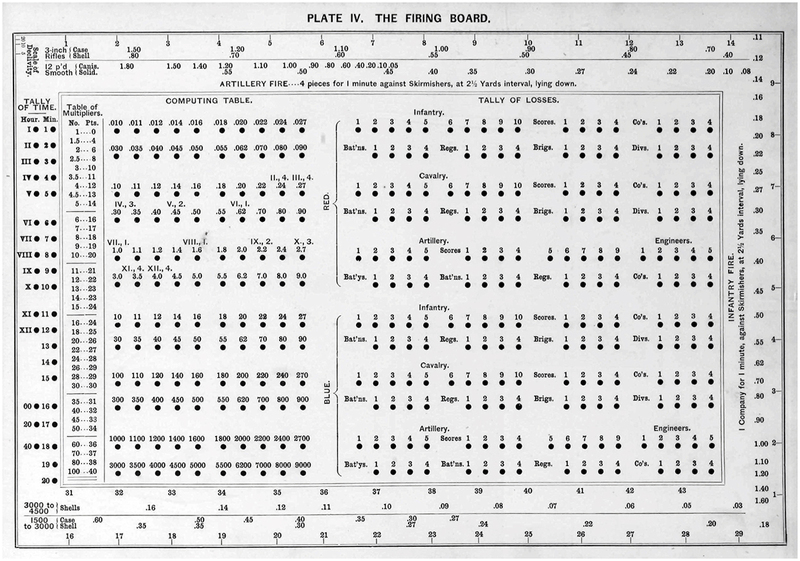 Upon being informed that a player wishes to fire artillery, the Umpire consults Table II A Possibility of Firing to confirm that the fire can occur. He uses the Artillery Fire Scale on the edge of the Firing Board to confirm the range and determine the base rate of loss. There is one range track for 3 inch rifled guns ranging out to 4,500 yards and another for 12 lb. smoothbore guns that ranges out to 3,000 yards, although when firing canister rounds that range is limited to 720 yards. Is the fight insignificant or considerable? If firing canister from 12 pounders at 400 yards, the loss will be 1.2 to 2.2 men per minute. Solid shot is unsuitable against skirmishers unless firing in enfilade. The 3 ½ inch rifles are equivalent to the fire of 3 inch rifles at ¾ of the same range. The battery of revolving 1 ½ inch cannons are three times as effective as a battery of 3 inch rifles at 5/4 the distance. A battery may vary the interval between guns firing together. Gatling guns and revolving cannon are allowed a larger interval than cannon. When limbers are withdrawn to shelter, a battery’s fire can be reduced unless its supernumeraries or an available infantry unit can bring ammunition up to the guns quickly enough to supply them. If artillery shifts fire onto a new target, the dice are rolled and the resulting total number indicates how many minutes will be required before the guns find the range. The amount of time needed for artillery to unlimber may be deducted from the time available for firing where appropriate. If the guns are firing from irregular ground, they fire to 0.70 effect, and at 0.80 effect if from soft ground. If the target is on soft or swampy ground, canister is only 0.25 effective; percussion shells 0.40; solid shot 0.50; shells 0.80; mitrailleurs and case shot 0.90. Artillery fire is also affected by firing against either a higher or lower elevation. A wall penetrable by artillery fire offers no more protection to troops than open ground, an abbattis protects troops behind it as if they were prone, a forest edge equally offers no additional protection because of the added danger of flying splinters of wood and stone, shells falling on hollows and places of shelter are half as effective as if fired directly. The second phase of combat is to record and apply combat losses to units. The third phase is to determine what troops may be dispersed as a result of combat. 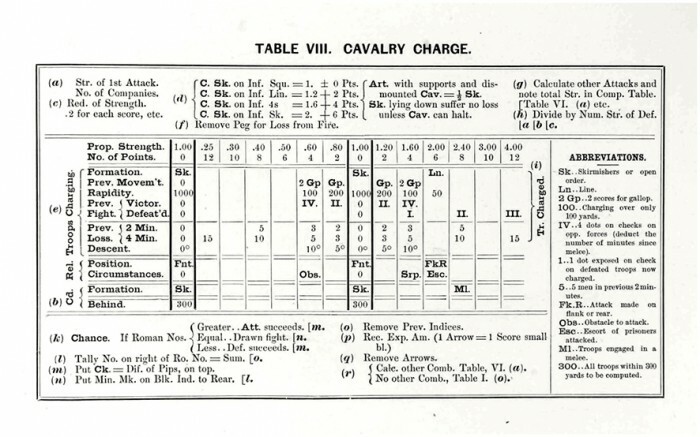 This is to be done whenever infantry or cavalry has lost five, ten, or fifteen men per company displayed as an average on one, two, or three scores displayed per block. The computation begins with a peg in hole 0.50 at the loss of 5 men, in hole 1.0 after 10, or hole 1.6 after 15 men – in other words in the hole 20 places in the series before that showing the unit’s total loss per company. Again using the standard infantry company case (64 men in skirmish order, etc. ), suffering losses sustained within a single minute, two dice are thrown. If the total of the two dice is greater than the Roman numeral over the previously placed peg, the unit is permanently dispersed for that day; if equal – temporarily dispersed; and if less, the unit is unaffected an fights on. The temporary dispersal will last 10 times the larger number showing on one of the two die thrown. A check marker with the same number of spots turned up is placed next to the unit block and a minute mark to note the time they are dispersed. The unit will also suffer one more score loss. The unit can again defend itself after the passage of twice the number of minutes shown on the check marker. A sword is placed to show the line of retreat. A minute mark is also placed next to any unit that is not dispersed but remains in place to show the minute when the loss occurred as a reminder to the Umpire of the first dispersion check prompted by casualties. A single such marker can serve for an entire line. 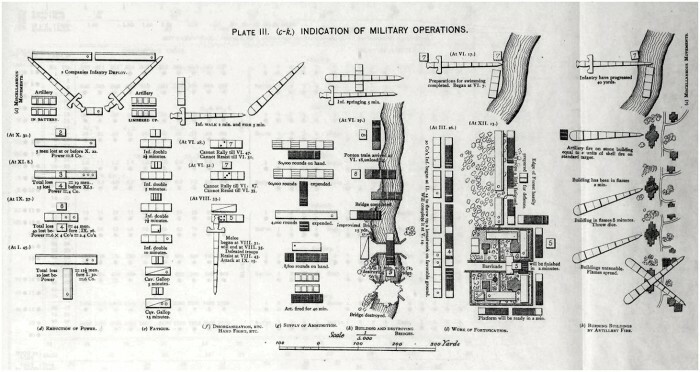 When the modifications have been expressed, throw both dice, and if the Roman number immediately above the peg is greater than the sum of the pips, the troops are permanently dispersed and cannot fight again the same day, unless under cover and in connection with other troops, and then with so little effect that it generally simplifying the exercise to remove the block from the plan. Whenever the fugitives are compelled to pass their comrades in the rear, it is better to turn the block around so as to throw the scores to the left and to lay an index upon them pointing to the rear, reminding the players that hereafter their movements are to be directed by the umpire. If the Roman number is equal to the sum of the pips, the troops are to be regarded as temporarily dispersed, and are to remain out of action ten times as many minutes as the greater number of pips on either die. A check with as many spots turned up is placed upon the block, as well as a minute mark to note the number of minutes since the X minute point, that have elapsed when they are driven back. One more score is turned over on the troop block, the troops are in condition to resist after twice as many minutes as the number of spots on the check. The minute mark is taken down and placed in front of the block at the first X minute point, and the check as soon as the troops are in condition to resist or at the subsequent X minute point at the Umpire’s convenience. An index is then placed behind the block to show the line of retreat. If the Roman number is less than the sum of the pips, the troops are not demoralized, but are allowed to remain. A minute mark is placed upon the block to note the minute when the loss of five men occurred, in order to enable the umpire to remember the time that has elapsed when five more are killed. At the first X minute point it is taken down. Put peg in hole corresponding to one tenth of the total loss. Modify for rate, i.e., time for five men to be killed, as in Table of Results. Find how many chances of remaining in 25. Note number in Computing Table equal to this. See how many places are between this hole and 25, in the series. Find the hole as many fifths of this distance from 25 as the number of men killed since last count. Put peg in Computing Table as many holes before the 4.0 hole as number of hole last found. Throw the dice and proceed in usual manner. Table VI. Movement sets forth movement for Infantry, Cavalry, Artillery and other units across a range of conditions, including movement up and down hill. The infantry pace is based upon a 28.8 inch stride so that 100 paces equals 80 yards, and movement will be about 110 paces per minute on hard level ground or a well-kept road. At double time, with a 33 inch stride, infantry doubles the ground it covers. It cannot move up a slope of 45 degrees or greater.Formation changes require a quarter of a minute to execute. Infantry emerging from forest will require two to eight minutes to rally before proceeding, based upon the density and extent of the forest passed through. Likewise, it will require 4 minutes to rally after passing through a captured village. Cavalry are a little faster than infantry at the walk, especially on a good road, although on soft marshy ground they are slower. They can trot at a rate of 240 yards per minute for a short time, but over a longer time it will break into a gallop and become fatigued. The best movement choice is for cavalry to trot and walk 880 yards over five minutes (6 miles an hour) which will not impair their efficiency. Horse artillery moves like cavalry as does mounted artillery over a short distance on hard, level ground. Artillery limbers and unlimbers in about a minute. A six mule train or a reserve or wooden pontoon train moves as heavy artillery. The advance guard’s canvas pontoon train moves like light artillery. Movement downhill carried no penalty unless the grade was steeper than 10°, or 10 feet over 20 yards, in which case the moving unit lost 10 yards distance in permitted movement for each 10 feet descended. A movement either up or down hill at double time would cost 20 yards. No slope of less than 45° is inaccessible to walking infantry if the ground is otherwise favorable. Cavalry units are similarly not affected by an uphill grade of less than 5°, although each additional 10 feet in vertical movement costs 40 yards in overall permitted movement. Cavalry walking downhill expend an additional 60 yards in overall permitted movement for every 10 feet of vertical distance above the 5° gradient. They can walk uphill on gradients of up to 30° and downhill up to a 20° maximum. At the trot, the maximum grades are 20° uphill and 10° downhill, while at the gallop they are 10° uphill and 5° downhill. The American Kriegsspiel rules also provided for consequences of fatigue on unit movement and in carrying out other actions. For example, infantry moving at the walk is briefly unsteady in firing, while a long run increases that effect as the hands tremble and vision is briefly obscured. 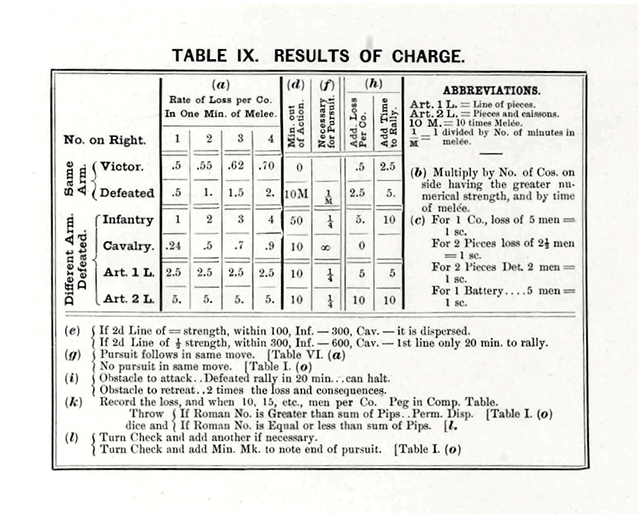 The rules offer additional guidelines, noting that on hard level ground, infantry at double time for infantry or cavalry moving at the gallop for only 1 minute in 4 and ordinary gait otherwise would not be affected. However, 10 minutes moving at rapid gaits cuts infantry’s efficiency by 1/5 or 20% due to straggling and the physical incapacitation of some of the troops. Cavalry that charge skirmishers will not affect infantry skirmishers who are able to remain lying down in the face of the charge. Surprise is possible if charging cavalry can approach within 240 yards (300 paces) without being observed or if infantry likewise charges from 80 yards (100 paces) without being observed. 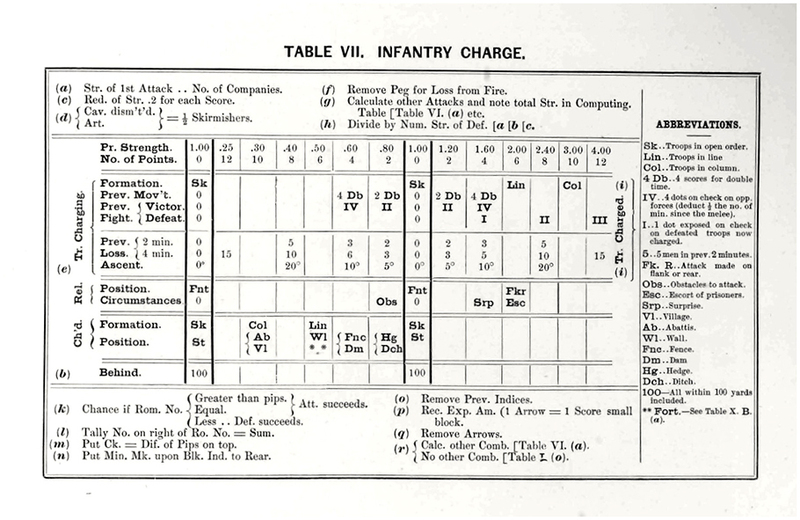 There are separate tables for the resolution of charges – Table VII Infantry Charge and Table VIII Cavalry Charge – and then all charges conclude on Table IX. Results of Charge. The Umpire divides the number of attackers by the number of defenders and places a peg in the appropriate hole of the Computation Table. He then adjusts that peg based upon additional modifiers based upon formation, type of troops engaged (i.e., infantry versus infantry, infantry or cavalry versus artillery, cavalry versus cavalry), fatigue, any prior hand to hand combat and its outcome, losses to hostile fire, terrain or obstacles, fortifications (which may require reference to Table X. Engineer Operations, Etc. ), among other factors. The Umpire then throws the two dice. The difference between the numbers on the two dice determines the duration of the melee in minutes. The total of the two die determines the victor when it is compared to the Roman numeral above the hole in which the peg ended up after all modifiers were computed: if the die roll is equal to or greater than that Roman numeral, the attack succeeds. When determining the outcome of a cavalry charge, a dice roll that equals the relevant Roman numeral on the Computation Table results in a draw (vice the infantry’s victory) and both sides’ cavalry withdraw and remain out of action for 10 minutes. The second phase, melee, generally lasts one to five minutes. When infantry fight infantry, or cavalry fight cavalry, it rarely results in more than the loss of two men per company per minute for the defeated troops (about half that for the victors). However, the cavalry hold an advantage against infantry, who when defeated are at the mercy of the mounted arm. Defeated cavalry will usually lose about half their strength while infantry defeated by cavalry will generally lose twice as many as they would against infantry. A battery of artillery attacked by either infantry or cavalry, and not supported by any other arm, will lose five men in the first minute, and 10 additional men for each subsequent minute of occupation.The attacker will have similar losses for entering a battery while another unit engages the units supporting the battery. To determine the total actual losses in melee, two dice are rolled. 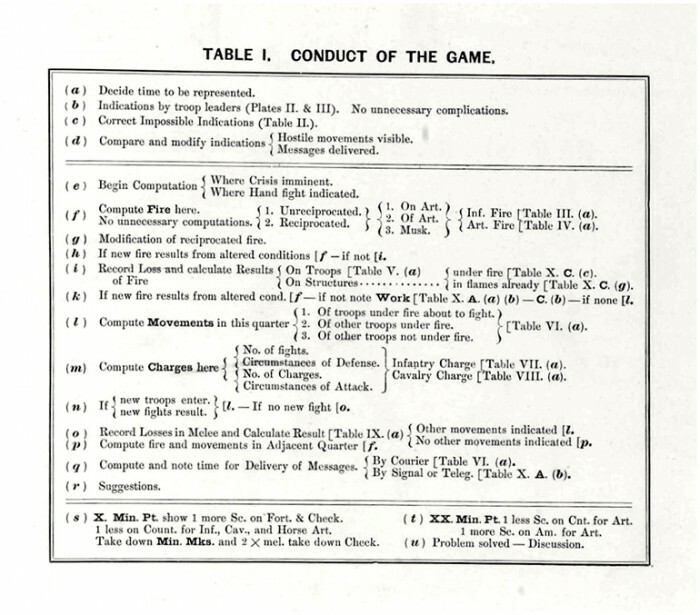 The Umpire looks for the Roman number on the Computation Table that is equal to the sum of the roll of the dice. 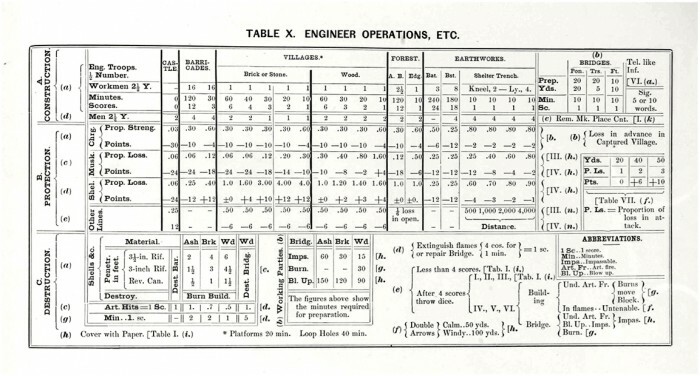 Then take the Arabic numeral that is to the right of the Roman numeral and find the column (Number on the Right) headed by that number on the Computation Table. The line corresponding to the nature of the fight, whether infantry vs. infantry, etc. is then cross referenced with the previously identified column to obtain the number of killed and wounded per company per minute which when multiplied by the listed modifiers will determine the rate of loss per company for the defeated units and the victorious units (further multiplied by each side’s number of companies and the number of minutes the melee lasted). Table IX. Results of Charge also sets out the steps for determining the forces involved in a pursuit, the losses inflicted, and the duration of the pursuit. The rout and the pursuit then follow each combat as it is resolved. The defeated troops must withdraw from fire and the pursuit, and may not rally and reform for between 10 minutes to one hour. This can be reduced to 10 to 20 minutes if there is a friendly force at least half their strength some 100 to 300 yards to the rear, if infantry, or 300 to 600 yards to the rear if cavalry. For the victor, Livermore writes that pursuit is the real opportunity to “reap the fruit of his labors”. In an infantry on infantry or cavalry on cavalry pursuit, each pursuing company inflicts a loss of 2-3 men per minute per defeated company. However pursuit will only last for about 10 minutes in open ground as the “fugitives outrun the victors” and the victors will then spend twice as long rallying and reforming as they spent in pursuit. If cavalry are pursuing defeated infantry, the latter’s losses are five men per minute per company. Defeated and fleeing cavalry will suffer the same rate of loss if suddenly up against an obstacle barring their path. Any surviving elements of such a force will require ten times as long to rally as they spent in flight. The final chapter, X, reviews the operations of Engineers and the construction and/or destruction of structures, fortifications, bridges, etc. setting out the amount of time needed for such activities. As previously noted, Table X. Engineer Operations, etc. also provides information as to the degree of protection (or lack thereof) offered by these structures, etc. to units in the game. The rules emphasize that identifying a winner and a loser in a particular game is greatly eased by the fullest record of casualties as well as of actions taken and their success or failure during play. The final judgment of victory is left to the Umpire, but his work is greatly facilitated by the records kept during play. American Kriegsspiel is consistent with many modern war games as many of its features have been borrowed from other earlier games. Livermore was neither the first nor the last designer of a wargame to accept the principle that in game design steal from the best. 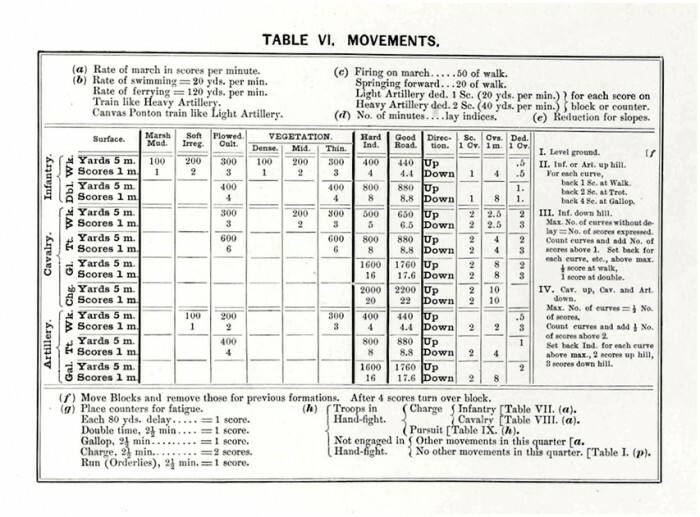 The informational aids introduced here, by Livermore’s own admission, were not entirely new and yet will be recognized in function if not in form by many modern gamers – unit markers that present information on formation, strength, and condition as well as informational markers that elaborate on strength levels, ammunition supply, fatigue, intended actions, etc..
And yet he still based these tables upon actual experience. 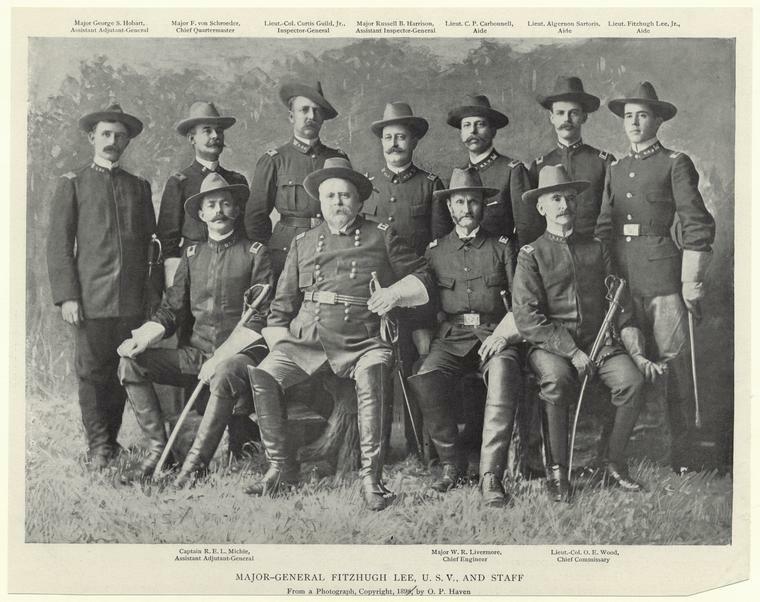 He had invented a new magazine fed rifle, led a prize-winning regimental shooting team, and designed and built shooting ranges at several frontier Army posts. One of the principal changes he would make in the 1898 edition was by introducing an additional modifier to reflect the improved smokeless rifles then coming into use.